Going into the hospital I was so nervous, my heart was beating out of my chest! Being my first pregnancy I had no idea what to expect, both Chris and I were just hoping for good news. The EPU unit were great and explained everything, they sent me off for a scan first and said they would then discuss the results with us afterwards. My bladder was near to bursting as I was glad we did not have to wait too long! 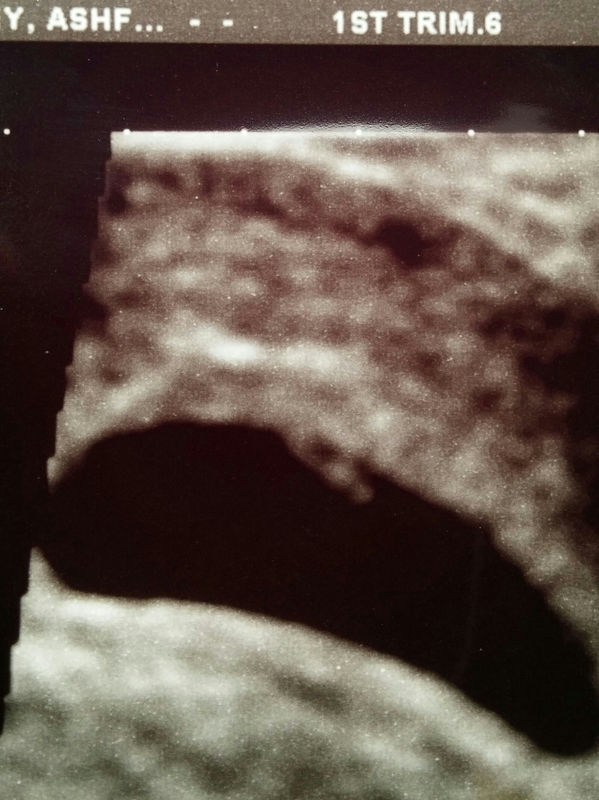 The sonographer was lovely and talked us through what he was looking at. We could see on the screen the tiniest little thing which looked like a prawn perfectly sitting in the sac which was amazing news. He even managed to let us hear the heartbeat which was incredible! The cause for the pain was then discovered, I have a 2.5 inch cyst by my right ovary which the EPU nurse explained was very common and said it should just shrink on its own. They booked me in for another scan at 9 weeks just to check the cyst and hopefully to see that it has either gone or got smaller. Our prawn is now dated at 5 weeks and 6 days making the due date the 4th January 2016.